Breathing new life into objects of the past, Johnny Stevens highlights rust from one-of-a-kind finished vintage cars in his latest project: Rust Rapture. The abstract artist with over 30 years of professional experience in painting, sketching, video and photography seeks to reveal unique perspectives of ordinary images while evoking a sense of mystery. 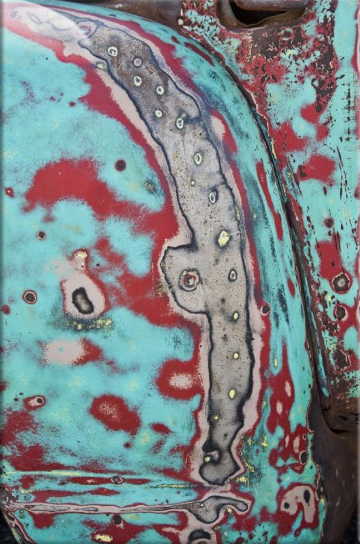 Rust Rapture features images of “hot rod” and “rat rod” cars that have survived 40 plus years of sun, heat and rain. These harsh conditions create rust with gorgeous color patterns and textures with stunning explosions of movement and shape. Born from Stevens’ attendance to the Lonestar Rod and Kustom Car Round-up in Austin four years ago, dozens of vintage cars are depicted in his Rust Rapture collection ranging from a 1924 Ford Model T to a 1966 Chevy. 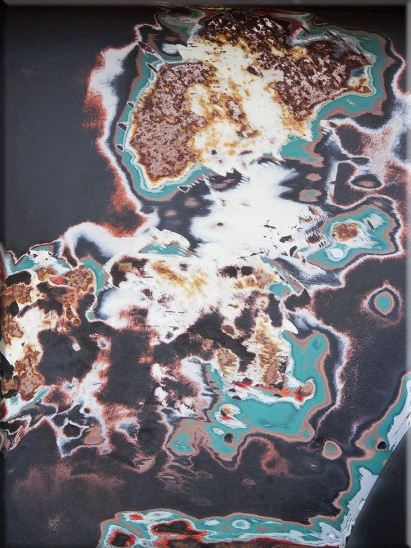 Stevens’ inspiration for this series originated from the abstract pieces he painted while studying at Fleming College, an art institute in Florence, Italy. There, he learned to appreciate painting disrupted patterns while still honoring the balance in composition. However, over the course of his life, he has been most motivated by Salvador Dali’s surreal representations. The next showing of Rust Rapture will be early summer, July 1-29, at the O2 Gallery and Project Space at Flatbed Press. Stop by to see the playful works of this multi-faceted, commercial artist and respected member of the National Association of Photoshop Professionals, Professional Photographers of America, Texas PPA, Austin Guild PPA and Interior Designer Society. For more information on purchasing items from this series, visit: Johnnystevens.com/rustrapture.